MEMOFIN - Dark Pools, Internalization, and Equity Market Quality - L'information financière que vous ne trouvez nulle part ailleurs ! Over the past decade, equity markets have been transformed by the forces of technology, regulation, and globalization. Today, the way in which investors, market participants, intermediaries, and trading venues interact is highly automated and critically dependent on speed. Significantly, the dominance of the incumbent exchanges has been eroded and liquidity has fragmented over numerous trading venues as competition has intensified. Within this fragmented environment, off-exchange trading, including broker/dealer internalization and dark pools in which prices are not displayed prior to execution, has grown significantly. Undisplayed or “dark” trading away from public exchanges in the United States is estimated to account for approximately 31% of consolidated volume as of March 2012 — a growth of around 48% since the start of 2009. From a market integrity perspective, the growth in dark trading raises various issues, ranging from concerns over transparency to considerations over fairness, particularly in relation to investors’ access to these undisplayed trading venues and the basis on which they compete with traditional exchanges. Moreover, members of the CFA Institute Capital Markets Policy Council have raised concerns that the incentive to display orders in public markets is being undermined by certain off-exchange trading practices, such as sub-penny trading in which over-the-counter market makers fill retail orders ahead of displayed limit orders by offering price improvement in fractions of a penny. In turn, these concerns have implications for public price discovery, liquidity, and the quality and integrity of markets. Regulators around the world have also voiced concerns about dark trading, including the U.S. Securities and Exchange Commission (U.S. SEC) in its equity market structure concept release (2010), the European Commission in its review in 2011 of the Markets in Financial Instruments Directive, the International Organization of Securities Commissions (IOSCO) in its report on dark liquidity (2011), as well as regulators in Canada and Australia in their reviews of their respective market integrity rules. Certain regulatory proposals, including those of the U.S. SEC, remain under consideration. 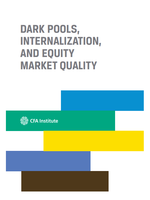 The report Dark Pools, Internalization, and Equity Market Quality presents an examination of the relationship between dark trading and market quality in order to inform public policy issues related to undisplayed liquidity and to address the aforementioned market integrity concerns. Specifically, we examine the relationship between different types of undisplayed trading volumes and market quality measures, including bid–offer spreads and top-of-book market depth. The results of our analysis show that increases in dark pool activity and internalization are associated with improvements in market quality, but these improvements persist only up to a certain threshold. When a majority of trading occurs in undisplayed venues, the benefits of competition are eroded and market quality will likely deteriorate. To protect market integrity, we recommend that (1) internalization of retail orders be required to offer meaningful price improvement, (2) regulators monitor the growth in dark trading and take appropriate measures if it grows excessively, and (3) dark trading facilities improve reporting and disclosures around their operations to enable investors and regulators to make more informed decisions about their use.